Home Interviews Interview: Martin Barr – looking forward to the Belfast Arenacross! It has been a busy couple of weeks for Martin Barr. 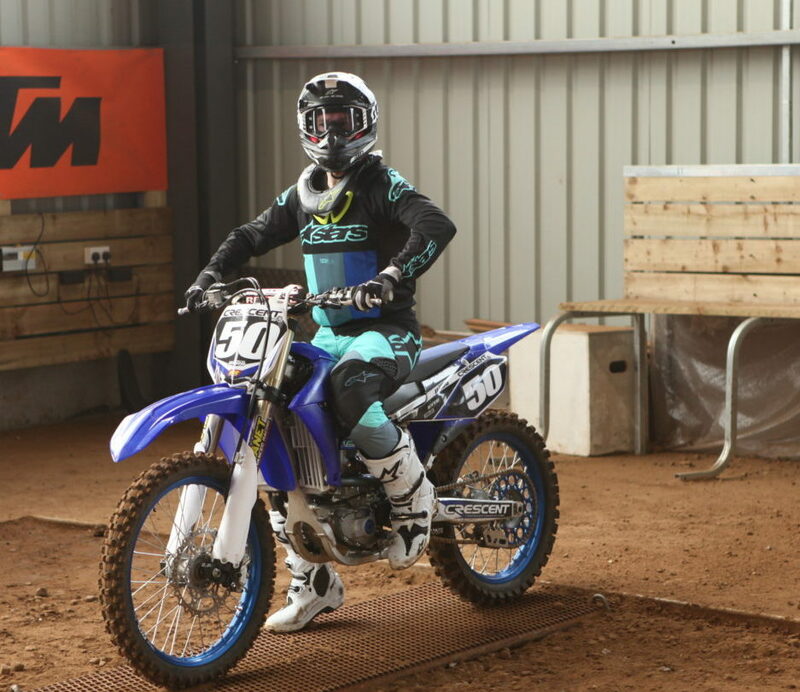 After a week in Spain training and riding with Jonathan Rea, Barr then organised and took part in an Arenacross preparation day organised by E-Trax NI, Ireland’s only indoor electric bike facility, to allow the local riders a chance to get acquainted with an indoor track and most importantly the whoops! This Friday and Saturday night will see Barr make his Crescent Yamaha debut in front of his home crowd at the SSE Arena in Belfast as he takes on the Arenacross specialists from all over the world. We caught up with Barr to get his thoughts on the weekend and being able to give back to the sport he loves. How do you feel the day has been going here at E-Trax? I’m over the moon, the first session has been really good, and I’m looking forward to that to help the younger kids here in the second session. If there are no young kids coming through, there will be no future riders coming through from Northern Ireland or Ireland to represent at the MXoN and all the rest of it. So to give these guys a bit of an insight into what they are up against, it gives a big tick in my box to allow them to see what it’s all about. At least we can have a bit of feel now and go in and look forward to it, instead of being nervous on Friday morning because you don’t get much time on track before the heats for qualifying start. Just a big thanks to E-Trax and the MRA and everybody involved for putting it all together, it’s been a massive successs. Hopefully we can go out this weekend now and get some results. And on your preparation, you are just back from Spain, putting in the laps in Spain, obviously it’s now Arenacross but some of the tracks looked pretty jumpy so do you feel you have got some good preparation for it and the outdoor season ahead? Yeah, Spain was really good. We went out with Jonathan Rea, Gavin Hunt, Jack Henderson, Davey Mulligan and a few other guys. It was a brilliant trip, it was six days riding out of seven, it was pretty tiring and intense but we got a good program going in the gym and stuff and made the most of it. Some of the tracks were really, really good, some supercross jumping stuff but as far as (direct) preparation for this weekend, it’s minumum. But I’m not stressing too much, I have been riding the bike for a long time and the new Crescent Yamaha is working fantastic, with my dad back on the engines, MB performance, he has it working really good and with Planet Suspensino still on board it’s working like a dream. So it’s all down to me, it’s going to be a long season and it’s something where I just want to keep building and progress. I’m just looking froward to being back involved with the Arenacross, it’s been since 2013 since I last competed in it. To have my debut race for Yamaha this year in Belfast, it’s going to be special and hopefully all the local crowd, I’m sure they will, can get behind all the home guys and we can put on a good show for them. You are the only full-time motocross Pro from the British scene racing the Arenacross series, does that surprise you? Yeah, a little, Elliott Banks-Browne had done it the last couple of years, I’m not sure why he isn’t doing it this year so I’m the only one doing it. It’s going to be tough, a big learning curve doing it. Every time you are on the bike, no matter what age you are, you are learning. These French guys, Italians they do this day in, day out, so yeah it’s going to be tough but it’s an opportunity I am grabbing with both hands and just enjoy it and hopefully come away with some good results and as long as I have a smile on my face it will all be good. And the British championship is shaping up with Revo Husqvarna signing a couple of GP riders, Conrad Mewse and Bas Vaessen in, it is shaping up Tom be a good and competitive series with more GP riders in it, similar to when you were coming through, but I’m sure you’re ready to battle them! Yeah it’s looking really good, there are some good names there and it’s going to be tough. Obviously I am getting older, I am probably one of the oldest guys in MX2 but my experiance and desire, I still have the fire in my belly and I still feel there is a British championship in me. It’s not going to be easy, we don’t have the budget those guys are running, it’s just going to be me and my dad in a van parked up with the rest of the Crescent guys. It’s going to be tough but it’s something I am looking forward too, I have been working as hard as ever and I’m feeling good on the bike and just got out and give it my best shot. Hopefully we can get some good results and keep it up throughout the year and be there or thereabouts at the end and get that championship.